The fastest way to get lousy scores for problem sums is to ignore the importance of creating a unit statement correctly. This is because many (UP TO 70%) of the problem sums can be solved easily using units and the units table. However, many students fumble at 'shifting' the letters and units, because they are not clear whether to choose + or - sign. Unfortunately, there are all sorts of permutations which worsens the situtation. Well, NOT TO WORRY. All we need is some tricks and some practice. It is good to ALWAYS rearrange the positions by placing the letters on the LEFT side and numbers on the RIGHT side. When shifting the letter or the number, remember that if they are moving to the OPPOSITE side of the = sign, change the mathematical sign to the opposite one. '- 2 u' becomes '+ 2 u' when it CROSSES OVER from the right to the left side of the = sign. '+ 5' becomes '- 5' when it CROSSES OVER from the left to the right side of the = sign. The above discussion is just THEORY. Now, let's move to some practice. 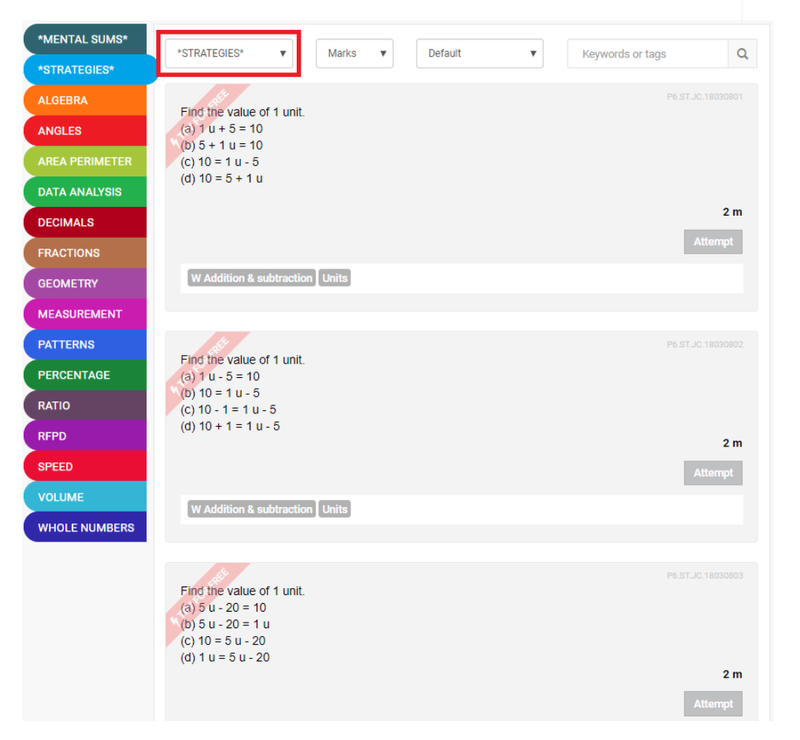 We have created 24 types of permutations from easy to hard. Let your child try and see if they are TRUE MASTER of the UNITS statement. STUDY SMART. Aim to get a gold for speed. If you have them all done correctly, move on to other MASTER questions. We have 5000+ and growing MASTER questions for you to try. All come from modified top school exam papers. Every Master question can be CLONED unlimited times until the concept CLICKS in your child's head. In future postings, we will be focusing on STRATEGIES and MUST-LEARN template questions. If you would like to receive them, like us to receive the latest posts.